John King came to Camberley with his parents in 1924. His father was a retired Indian Army Officer and his mother was a trained soprano and lead the Camberley Operatic Society for five years. By 1934, John and his friend Peter Cook had set up a basement cinema with a 4/6d projector and 6d roll of film. They later progressed to 16mm film and by 1936 had their own 16 seater cinema. In 1937, whilst still at school John set up Kincar Cine Supplies using the sub-post office shop window. John covered many local events between 1936 and 1939 and there wasn't much he missed. The films were packed away for 30 years and in 1970 they were brought out and shown to a packed audience in Camberley's Civic Hall. Repeat showings were made the following 2 years and again in 1986. Sometime after this John had them transferred to VHS, had them edited and gave his own voice over. All this seemed to pass into history but the beauty of having a video shop is some strange things come through the door and so it was a few years ago the VHS featuring all the Camberley footage was found in a box of old tapes someone was discarding. After reading the paper insert inside the box I knew this had to be converted to DVD or be lost forever. 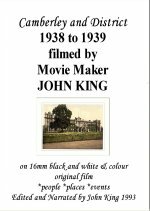 There is nearly an hour of amazing independent film footage from Camberley as it was just before the outbreak of WW2. Highlights include the RMA, local public houses and shops, and the unforgettable Camberley Kate and her dogs. John was very active in the community and did a lot for local hospices and Frimley Park. For this reason we shall keep this legacy alive and donate £2 of every sale to a local charity. ~ Chris.